Every year at the end of May there's a Fibre Potpourri held at Olds College in Olds, Alberta. Not to be confused with Olds Fibre Week at the end of June, the Potpourri is organized alternately by the Edmonton Needlecraft Guild (ENG) and the Calgary Guild of Needle and Fibre Arts. Both are part of the national organization, the EAC -- Embroidery Association of Canada -- but in addition to embroidery, the Potpourri offers opportunities to explore and learn about different hands-on artistic media, generally focused on fibre. Arlene Westen Evans of High River and St. Albert, AB - "Waxing Poetic with Fabric and Collage". Arlene's class was where I found myself, with my friend S and 11 others. Thirteen is a large class and two days a very short time to learn anything but the very basics about encaustic wax painting. That said, Arlene taught with humour, wisdom, and as much depth as she could inject into so many lively minds over such a short time. I came away completely exhausted, my brain buzzing, and my mind entirely uncertain as to whether or not this technique would be of any use to me in the future. I admit I was drawn to the class because of the word 'fabric' in the title. Almost immediately I realized that the question I had to address for myself over the course of two very full days was, "Why would I want to coat fabric with wax?" Encaustic work is a very painterly process, and I am not a painter; I'm a stitcher. I like the feel and the 'hand' of fabric as I work with it. Wax renders fabric very stiff and though I could needle through it, it could get messy as it softens under the heat of one's hands. You can bet I'd hesitate before asking a sewing machine to stitch into waxed fabric! Nonetheless, I organized my work space with these basic supplies -- some from home and some from the kit Arlene provided each of us: beeswax in yellow (natural) and white; a tin of beeswax mixed with demar resin (a hardener); a small electric fry pan; a heat gun for fusing the wax to the surface of each piece; several cat food tins to hold the melting wax; wood and particle boards - substrates for each piece; natural bristle paint brushes in a variety of sizes; paper towel; vinyl gloves (which I never wore; I don't like working with gloves on my hands); assorted papers, fabric and threads; a larger board to serve as a hot pad for the heat gun; and a recycled piece of plastic shower curtain with which to protect the top of the table. I began with paper. I glued a failed water colour painting to the one board that had a painted surface (part of a grab-bag of collage materials, it had come to me that way). One needs an absorbent surface on which to apply the wax, so the paper provided that on the painted substrate. After a few layers of wax, the picture took on a rather attractive glow and was, in the end I think, prettier than it had been to begin with. I added the fence and other brown lines (and the birds) with Pitt (C) pen; in the final piece, the birds disappeared (impact of the heat gun) and the fence looked rather fuzzy, but it's still an 'okay' sample. 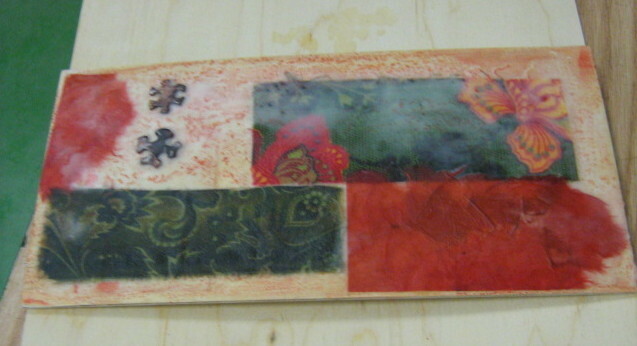 Next I moved to fabric in a collage on a wooden substrate. It too was okay, but of course the fabric doesn't look much different in texture than the rice paper that's also on the piece. I was going for a Japanese effect, very formal, which others assured me I'd managed to achieve. Again, an 'okay' sample. Finally I played with fabric -- two pieces of which I show here, plus a sheer piece that turned out less well. 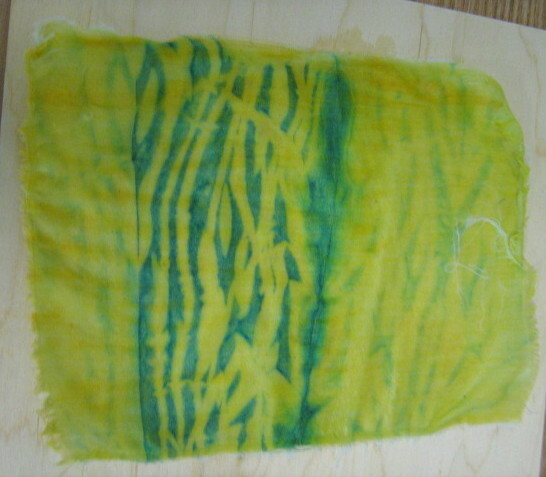 I coated each piece without a substrate, and peeled them off the plastic table cloth when the wax had hardened. Perhaps they could be worked into with thread and beads; perhaps they could be adhered to paper or cardboard as covers for small books. It's useful to know I can do that if need be in the future but in the end, at least for now (never say, "never"! ), it's not the way I want to work with fabric. So what came out of my encaustic adventure? the realization that on the artistic journey, I'll never be finished with "stepping outside the box". Step out of one, and land in another one...step out of that one into another...and so it goes. Oh...and one other thing. At lunch hour on Saturday, three of us hoofed downtown to the Different Strokes Art Gallery. There we saw some examples of encaustic wax painting, as well as many beautiful examples of oils, water colour, textile art, jewellry, pottery, glass ware, silk scarves, leather work and more. I found that a former teacher of mine, also a textile artist, Betty Caskey, has pieces in the shop. And...I struck up a conversation with the proprietor, Deborah Ohlhausen. She invited me to send her some images of my work, so there may be an opportunity there...Stay tuned! This is exciting Margaret! What a great kick off to your Summer School. I love the second green fabric sample. Great that you experimented... whether or not you use the technique fully, there may be something that sticks. What a beautiful setting to try something completely different. I find there is always something you can take away from a worksop, tucked away for future use. My head is spinning, Margaret, as I sit at O'Hare and try to absorb all you experienced! What fun!